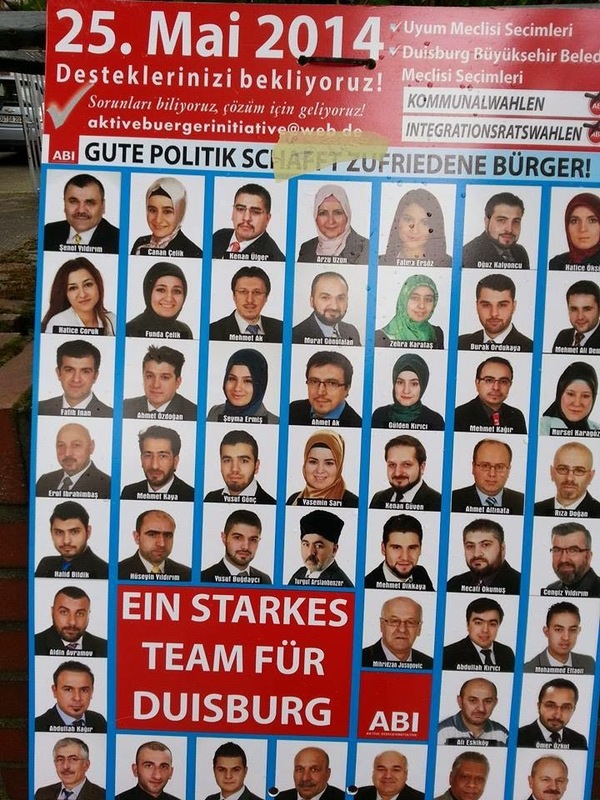 "A STRONG TEAM FOR DUISBURG"
Yes, we are talking about Germany! Just look at the fifth row, right in the middle... is he not a real Imam? And how many women with headscarf can you count? Did it to yourselves, take a bow. So not only is it aggressive atheism and new world order LGBT people like that conchita thing who won eurovision, but now its also aggressive islam who are fighting for who gets to be the new world order. Off course Christianity is out of the picture, soon atheism/islam will make all christian countries POST-CHRISTIAN! where is the new crusade, where are the Winston Churchill's, where are the followers of the bible, Christianity has become nothing but a lie, hardly anyone is a true christian, because if we were, we would have expelled all non-christian and LGBT people out of our christian countries, we need the renaissance era now more than ever! Muslims concentrate in infidel territory therefore creating a majority, then elect their own and begin to implement sharia. More infidels flee, the Muslim territory expands. Repeat. "Churchill entered an alliance with the openly atheistic Soviet Union of Josef Stalin "
FDR imposed Stalin on Churchill. Well, the one thing you cannot say, is that we blamed Churchill for starting it!